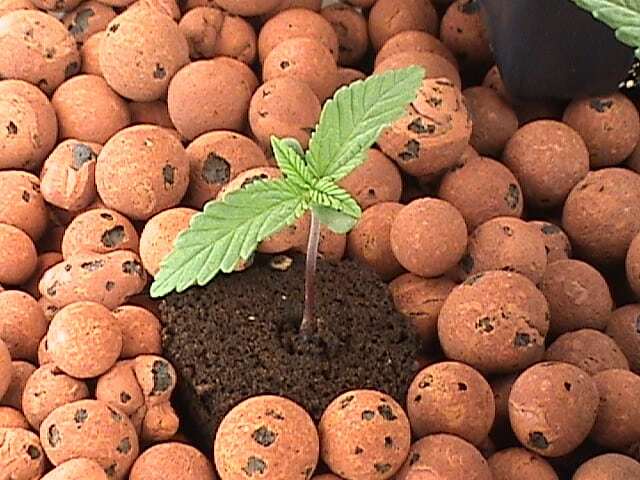 Let’s take a look at some marijuana growing soils and other options for growing marijuana. There are many options to grow with, and many different types of marijuana growing soils and products of which one is best. One of the fun things about growing cannabis is experimenting with different techniques and finding the one you feel most comfortable with. Some ways of growing cannabis can be messy, like if you use soil indoors. If you are the type of person who doesn’t want dirt under your fingernails, then using soil may not be your best grow medium to use. There are numerous choices when it comes to what to grow cannabis in as you will see when you visit your local hydroponic store, there are hundreds of different mixes, brands, and bottles all claiming to provide exactly what your plants need to live. Grow mediums are designed to help hold up the weight of the plant, while at the same time providing a stable base for the plant to grow roots in. Soil is composed of clay, sand, rock and organics. Organics are decomposed animal and plant matter that provide the soil with nutrient content. The rocks and sand provide drainage that helps the roots grow while the clay helps with moisture. Soil is often full of microorganisms that are breaking down the organics contained within it by feeding on them. Soil works very well in the ground but can heavy in containers because it can clump. The use of other ingredients with soil can help lighten it and help water distribute evenly throughout it. Perlite is a porous white substance that is used to stabilize water holding in plant mixes. It is very light and actually floats in water. Perlite is usually used for cloning and mixing with other grow mediums but in some cases is used as the primary medium. The Whittemore Company has been supplying perlite products since 1919 and we recommend them for all your perlite needs. Warning! When handling perlite, because of the dust it gives off, the use of a respirator device or facemask is recommended so as not to damage your lungs. Vermiculite, crushed volcanic rock, known as “puffed mica”, is medium that provides great drainage when mixed with other grow mediums. It holds water as well as a sponge and because of this, it is often mixed with other ingredients to help with air and water retention. Vermiculite is very lightweight. Vermiculite is not often used as a stand-alone medium. Warning! Dry vermiculate is harmful to breath. Before using it, wet it down so the dust doesn’t get in your lungs. Rockwool is spun rock that comes in multiple sizes of cube. The smaller cubes are often used for seedlings or clones, and are great at draining moisture. The larger blocks are regularly used in hydroponic systems such as ebb and flow trays. To make sure there are no air bubbles present, it is recommended to submerge Rockwool in water for 8 hours prior to use. Rockwool works well with Marijuana roots because it has porosity that helps hold air and water. It also is the right density so roots can easily grow and move throughout Rockwool. Rockwool is sterile, meaning it has no nutrients. When purchasing rockwool we always recommend using Grodan’s products. Warning! When using rock wool it is recommended to use a facemask when handling it. Rockwool gives off noxious fibers and should be wetted before use to avoid them. Hydroton is a lava rock or clay pellet medium, usually orange/red in color that is available in different sizes. It is highly effective in continuous drip and ebb and flow systems and is particularly useful when drainage is needed. Hydroton hold plenty of moisture, and are pH Neutral. Although hydroton is not as moisture retentive as Rockwool, it does hold enough moisture to keep the root ball from drying out and is preferred by many growers because of the fact that it is nearly impossible to over water when using hydroton. Because oxygen is an imperative element needed for proper root growth, the use of hydroton is great since it provides a lot of air flow to the roots and can help prevent what is known as “root rot”. Hydroton is also affordable, and can be re-used. Hydroton can be rinsed and washed with a light soap and left to dry, then re-used for the next crop. We have had some great grows as a result of buying Hydroton in bulk from Aquaponics USA. The use of Coconut fiber, or also called “coco coir” is becoming very popular amongst cannabis growers. Coco coir, like hydration, can be re-used, and also disposed in an environmentally responsible way. Coco coir, even when fully saturated, has porosity that leaves a lot of room for a large amount of oxygen and aeration. Coir is ideal for root growth and function due to its nutritional properties such as phosphorus and potassium. Coco coir drains very well, re-hydrates extremely easily, and dries out on top, which can help prevent the infestation of insects such as fungus gnats. Another advantage of coco coir is it helps prevent over fertilization and nutrients lockout, because coco coir does not store salts and nutrients that can become stagnate in other mediums such as soil. To learn how to grow cannabis from cannabis cup winning growers, enroll at the best cannabis training destination, Cannabis Training University. To learn more about the different types of products and mediums you can use to produce healthy, medical grade marijuana, check one of our other posts. To start a cannabis career as a growers or bud tender, sign up today here.